For those of us who do not read the release notes, when Exchange 2003 Service Pack 2 installs, along with it comes the new and improved Intelligent Message Filter (IMF) version 2. If one had installed the original Exchange IMF version 1 add-on, one needed to uninstall it before running SP2. Microsoft Exchange Intelligent Message Filter Exchange Server 2003 SP2 does not create the registry key named ContentFilter under HKEY_LOCAL_MACHINE\Software\Microsoft\Exchange during an upgrade from Exchange Server 2003 or Exchange Server 2003 SP1, where Intelligent Message Filter version 1 was not previously installed. 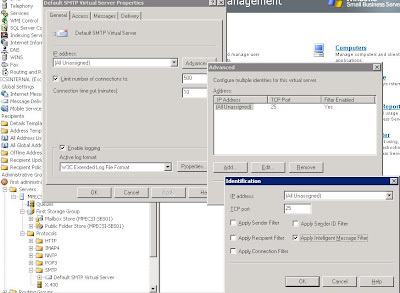 Therefore, to obtain an extended functionality (for example, change the Archive directory), you must manually create the HKEY_LOCAL_MACHINE\Software\Microsoft\Exchange\ContentFilter key and restart the SMTP service. So, if you are like me, we both knew about the IMF and were looking forward to enabling the feature to bring down our client's spam levels right? Note the Gateway Blocking Configuration setting to archive e-mail caught in the IMF. If we read the release notes, then we would have discovered that when Exchange SP2 was installed along with the IMF, that the proper registry settings do not get inserted for the archive folder location! The key is ContentFilter, the String Value "ArchiveDir" is your above created directory, in our case: "C:\UCEArchive". If the above folder is not created, where does the e-mail go? Hopefully on to the e-mail client. If not, you can bet that your client will be calling you with the elusive "missing e-mail" complaint. It should become second nature to follow through on the above configuration on all new servers that we build, or subsequent servers we come to service pack Exchange 2003 up to level 2. Exchange Service Pack 2 Release Notes. Exchange Server Intelligent Message Filter V2 Operations Guide. FAQ about Intelligent Message Filter (MS KB555602). 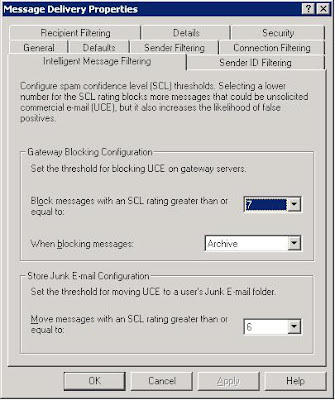 MS KB912587: Exchange Server 2003 Intelligent Message Filter does not provide the functionality to exclude a particular recipient from anti-spam filtering. The Microsoft Exchange Team Blog: Exposing SCL (Spam Confidence Level) in Outlook. UPDATE 07-10-11: Made a technical change. Had ContentFolder instead of ContentFilter above. My bad, and my apologies for the mistake. P.